Sometimes you cook or bake something healthy and can’t believe how good it tastes. 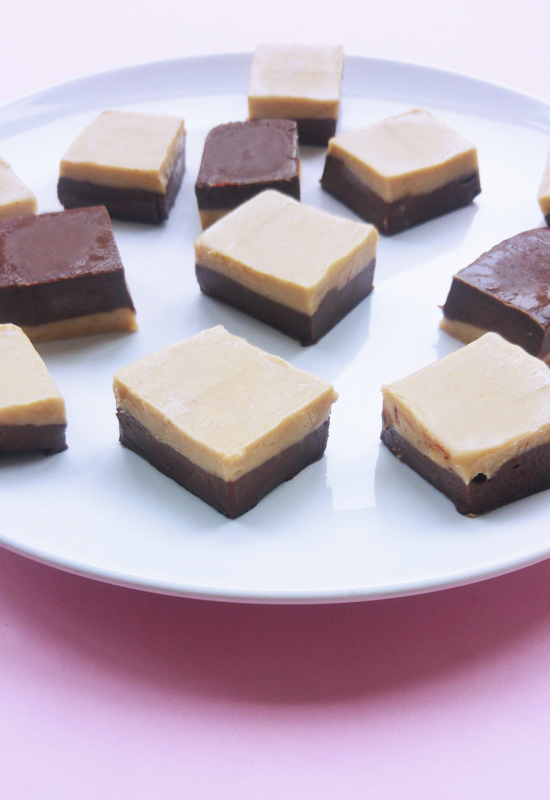 This vegan chocolate peanut butter fudge is divinely creamy, soft, sweet and it’s impossible to eat only one piece! Those of you who have been reading this blog for a while know that I’m all about healthy indulging. And let’s face it, many recipes are very good and taste ‘’healthy’’ too. Great! But sometimes you’re just not in the mood for another crispy maca glazed apricot covered in roasted sesame seeds. If you feel like old-school creamy, sweet fudge, this vegan chocolate peanut butter fudge is the real thing. It tastes amazing and on top of that it’s so good for you. Anti-oxidants, healthy fats, proteins, vitamins and minerals? They’re all in here. This dairy-free, refined sugar-free, vegan, gluten-free treat is made with only 5 ingredients, if you make your own condensed milk. 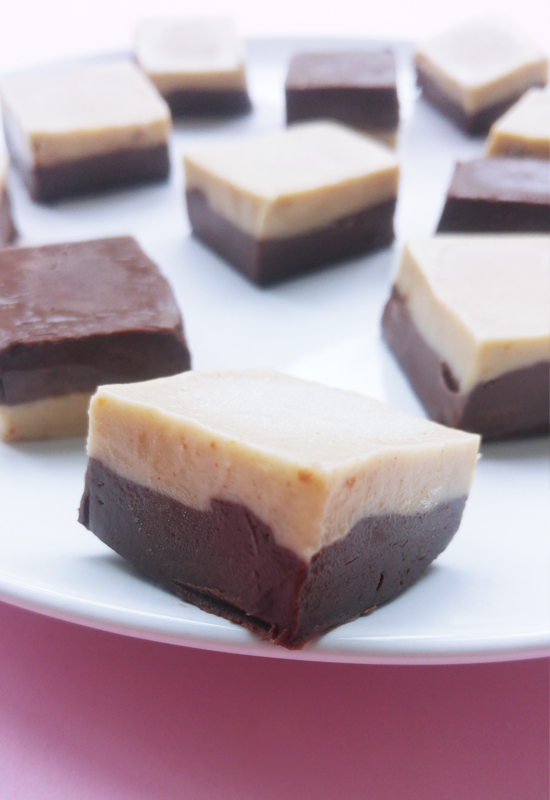 If you use store-bought condensed milk only 4 ingredients for double flavored fudge! What makes this fudge so creamy is the condensed coconut milk. I was so happyto find out how easy it is to make your own as it makes an amazing base for many plant-based desserts. If you want this to be 100% homemade, I highly recommend making your own condensed coconut milk. 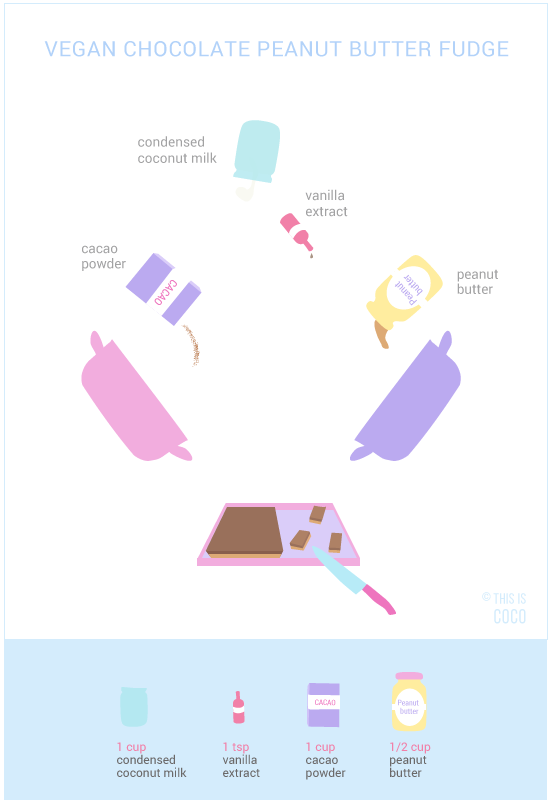 More about using coconut products for baking and desserts here. Cover a mold or bowl with a sheet of parchment paper. This well help you get the fudge out easier afterwards. Put half of the condensed milk in a medium saucepan over low heat. Mix in the cacao powder and stir for about 5 minutes until it’s all equally mixed. Pour the mixture into the saucepan and put into the fridge to set. Once it’s almost solid but still soft, you can put the peanut butter layer on top. Put the rest of the condensed milk in a medium saucepan over low heat. Mix in the peanut butter and stir for about 5 minutes until it’s all equally mixed. Remove from heat and add the vanilla extract. Pour the mixture into the saucepan on top of the chocolate layer. Place the fudge into the fridge to set for a few hours. Cut into squares and store in a sealed container the fridge. The fudge tends to get softer when it’s outside of the fridge, so it’s best served immediately!